Tuesday, October 13 1908 -- After trouncing the Tigers in the first two games of the World Series, the Cubs show they are human by losing the third game 8 - 3. If you like your comedy dramatic, and your drama comedic, look no farther than Vanilla and the Villains to give you healthy doses of old-fashioned melodrama with tongue firmly in cheek. Although you could say of the strip, which debuted on September 10 1928, that it was an unabashed rip-off of Hairbreadth Harry, that wouldn't be totally fair. 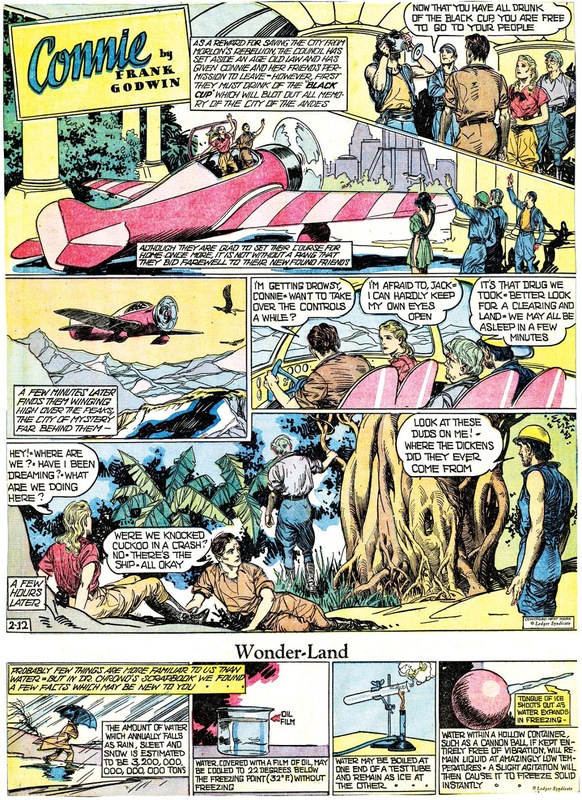 Y'see, the strip, though credited only to artist Darrell McClure, was (I am assured by multiple sources) written by none other than the great Harry Hershfield. Why does that pardon the strip's obvious copycatting? Well, because Harry Hershfield had been writing this style of satiric melodrama since 1910's Desperate Desmond. 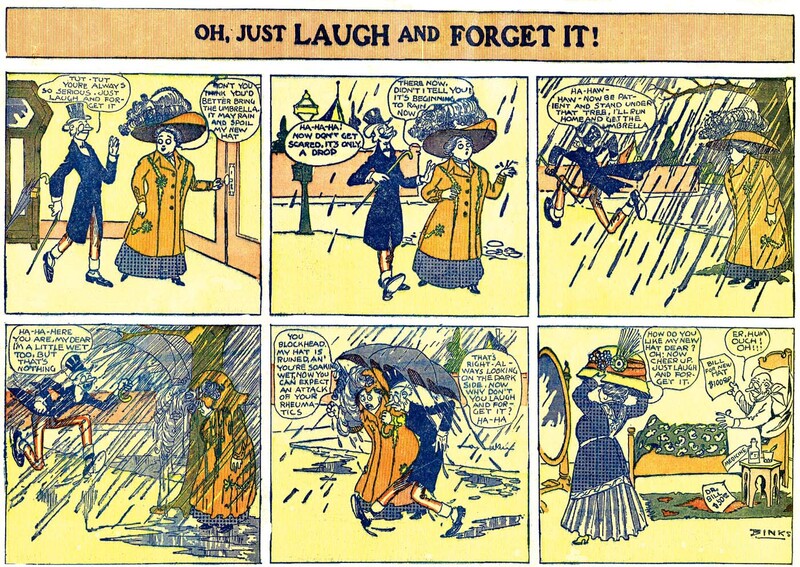 While Hairbreadth Harry pre-dates even that, Hershfield's strip was a daily, and the story continuities were much more involved than Kahle's strip, which was more episodic in nature on its weekly Sunday appearances. I see Vanilla as Hershfield's return to the style of Desperate Desmond, not as an attempt to trade off the popularity of Hairbreadth Harry, which by 1928 was not all that great. Vanilla and the Villains stars the delectably waifish and scantily clad Southern belle Vanilla, who is constantly being kidnapped by no-goodniks like Lambert Leer and The Master Mind. Villains who are mesmerized by the beauteous Vanilla are again and again foiled by her fearless and steadfast boyfriend, Stonewall. The stories are completely and utterly wacky pastiches of nail-biting Victorian thrillers, and the writing sparkles like a jewel. Hershfield was obviously having great fun writing this material, and the excitement infected cartoonist Darrell McClure, who on occasion signed himself 'Desperate Darrell McClure' as homage to Hershfield's early strip. 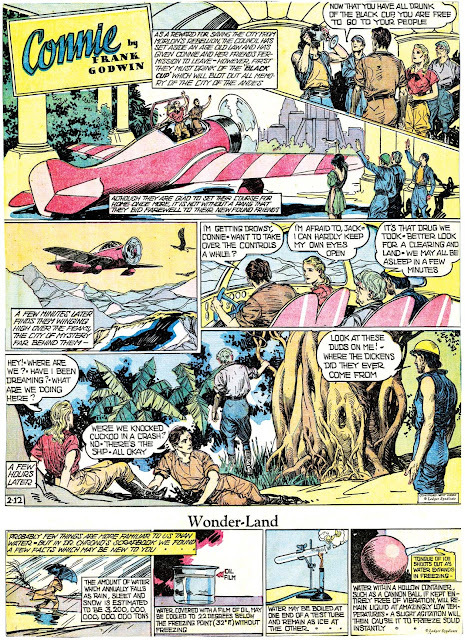 Vanilla and the Villains was distributed by King Features, which didn't seem to put much effort into the marketing, as it certainly ran in very few papers. Why they even put this strip on the roster is a mystery, as Hershfield and McClure had just tried another very much like it, Hard-Hearted Hickey, that had been cancelled after less than six months. Vanilla and the Villains did better, at least in terms of longevity. Though often believed to have ended in 1929, I can trace it to at least March 1 1930. That date has it ending in mid-story, so perhaps there is even more of the strip out there waiting to be found. The strip was advertised in Editor & Publisher's 1930 syndicate directory, which would seem to indicate that it lasted well into the summer of even fall of that year. Can anyone help to find the end of the run to this forgotten classic? PS: Speaking of further research being needed, in doing some research on this strip, I came across a mention in Ron Goulart's The Funnies of Gerald Greenback by Ray McGill, which he cites as being another of these humorous melodramas of the 1920s. Has anyone any evidence of this strip's existence? I certainly have never seen it nor heard of it outside this single reference. I have found an strip dated Septenber 26 1930, in The Evening News (Wilkes-Barre) If you want a copy, please let me know you email address. Sorry, your message was in the spam folder and I have seen it right now. 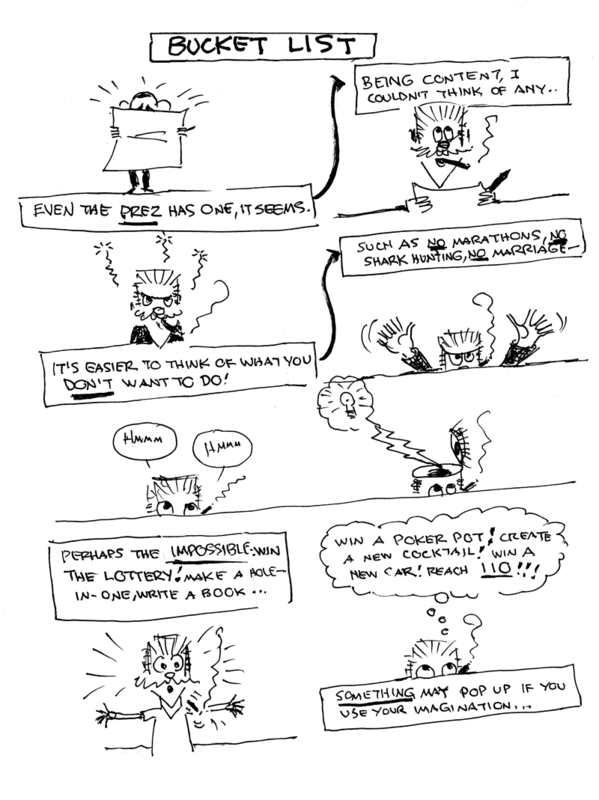 In any case I've tried to send the strip to the addres stripper() gmail.com but it doesn't work. When George Frink curtailed his daily strip work at the Chicago Daily News to try his hand at Sunday strips for World Color Printing, I guess he must have been ducking the News' contract. 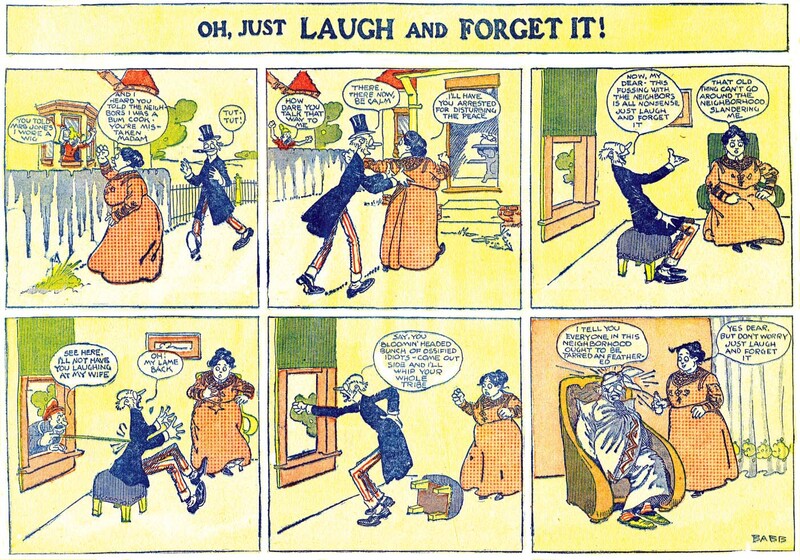 Frink's earliest work for WCP was the strip Oh, Just Laugh and Forget It which began on May 8 1910. At first he signed it 'Binks', then 'Babb', and sometimes didn't sign at all. It wasn't until three months into the run that he began to sign his own name to the feature. The plot of the strip is a very simple one and pretty repetitive, as was usually Frink's preference, but also as usual he added energy and fun to the proceedings with his use of high-energy slapstick body language. 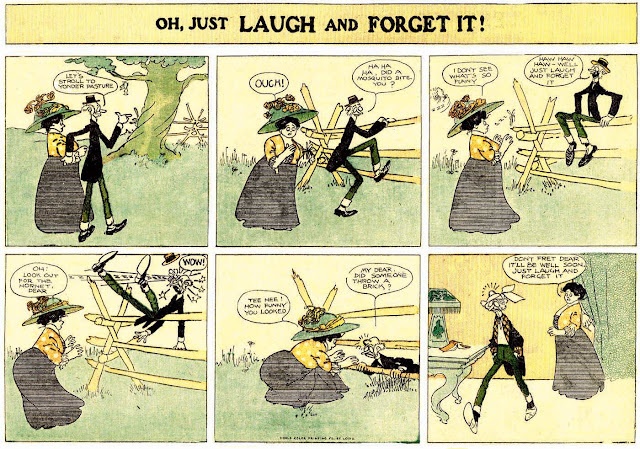 Oh, Just Laugh and Forget It ended on September 25 1910, right as Frink started the Sunday strip Slim Jim for WCP, which was his new name for his long-running and popular Circus Solly character from the Chicago Daily News days. Walter Wellington Quirt was born in Iron River, Michigan, on November 24, 1902, according to the catalog, Walter Quirt, a Retrospective: January 18-February 29, 1980, University Gallery, University of Minnesota, Minneapolis. The 1910 U.S. Federal Census recorded Quirt as the fifth of six children born to Arthur, a Canadian, and Theresa. His father was a water mill operator. The family resided on Sixth Street in Iron River. Quirt’s home address was 324 Sixth Street, Iron River in the 1920 census. At age 17, Quirt was a surfaceman at the iron mine. His father was a timber logger. According to the Retrospective catalog, Quirt studied at the Layton School of Art, Milwaukee, Wisconsin, from 1921 to 1923. The 1922 Milwaukee city directory listed his address at 510 Jackson, and occupation as student. From 1923 to 1924, Quirt was a student-instructor at Layton. Quirt was a full Layton instructor from 1924 to 1928. The 1926 Milwaukee directory said Quirt was a teacher and resided at 88 Knapp. Quirt’s address was 453 Jefferson in the 1928 directory which included his wife’s name, Martha; the date of their marriage is not known. They divorced in 1939. The Retrospective identified her as Martha Pearse. In Fall 1929 Quirt moved to New York City where he “attended meetings of the newly organized John Reed Club Arts Section.” He became its secretary in 1932 and showed his work at John Reed Club exhibitions. Quirt observed Jose Orozco painting murals at Dartmouth, and, in 1934, was a guest at Yaddo Colony. On October 16, 1935, Quirt was in the WPA/Federal Art Project with a position of artist. Later, he was master artist from March 12, 1936 to May 10, 1938. It was in 1937 that he enrolled in the mural project. Quirt remained with the WPA/FAP through 1942. In the second half of the 1930s, Quirt was an instructor at American Artists School. He crossed paths with artists Raphael Soyer, Romare Bearden and Salvador Dali. The Julien Levy Gallery, in 1936, held Quirt’s first one-man exhibition. The gallery’s second Quirt show, in 1939, featured his colored drawings. For the Bellevue Hospital Psychiatric Pavilion, Quirt painted “The Growth of Medicine from Primitive Times” murals in 1937. Quirt’s assistant was Eleanor Falk whom he married in 1939. The 1940 census recorded Quirt and Eleanor in Manhattan, New York City at 114 Perry Street. An exhibition of Quirt’s tiny paintings was at the Julien Levy Gallery in December 1940. In the early 1940s, Quirt gave private lessons at his studio. The 1942 and 1944 Manhattan telephone directories listed Quirt’s address as 219 West 14th Street. Quirt exhibited at American Associated Artists Gallery, the Downtown Gallery, Durlacher Brothers Gallery and the Brooklyn Museum. In 1944, Quirt moved from New York City and returned to the Layton School in Milwaukee. Also that year, his son, Andrew, was born. Quirt was one of over 100 artists who did a portrait of their artist friend Abraham Walkowitz. Twenty-five portraits, including Quirt’s, were published in Life, February 21, 1944. Quirt moved on, in 1945, to an assistant professor at Michigan State University in East Lansing. The Fall 1947 found assistant professor Quirt teaching at the University of Minnesota where he remained until his death. From 1945 to 1947, Quirt exhibited at Durlacher Brothers Gallery; the Michigan Artists Exhibition which awarded him the Cranbrook Prize; the Whitney Museum of American Art; and St. Paul Gallery, St. Paul, Minnesota. His son, Peter, was born in 1948. Throughout the 1940s, Quirt proposed projects to his friend Stuart Davis, who declined Quirt’s overture to teach at Michigan State University.His son, Jonathan, was born in 1952. In the 1950s Quirt exhibited his work in New York and the Walker Art Center in Minneapolis, Minnesota. In 1955 he was associate professor in the Art Department at the University of Minnesota. Quirt passed away March 19, 1968, in Minneapolis. The cause was lung cancer. Here's a special Labor Day obscurity for you, straight from the pages of the Daily Worker. As we know, Labor Day is a commemoration of the American labor movement, which in turn was heavily influenced by so-called radical political organizations like the Communists, Socialists, Wobblies and others. The Daily Worker, which began publishing in 1924, was a newspaper published by the American Communist Party. The newspaper reported on mainstream news stories with a heavy-handed Communist political slant. While the newspaper was undeniably highly partisan to its cause, and the writing so clunky that it is truly painful to read, it must be said that the Worker was valuable in at least one way. When very few mainstream papers would take the side of the worker, frivolous editorializing to the contrary, this newspaper reported truthfully on the horrors encountered by laborers when they were pushed too far and struck for better conditions. You'll find very few other papers that were willing to report on the beatings and murders endured by those yearning for a fair deal from their employers. Surprisingly enough, the Worker did occasionally run comic strips. Of course, the strips were seldom actually funny, hamstrung as they were by the Worker's political message that permeated everything they did. By far the longest-running was Little Lefty, which we covered here way back in 2006, and which sometimes actually managed to be slightly entertaining. More typical of the Worker's comics is Jim Martin, the tale of a man who becomes active in the labor movement. The politically-charged strip ran in the Worker from August 21 1933 to January 30 1934. The art was by a fellow named Walter Quirt, who showed no particularly great gift for cartooning. The story was first credited to Howard Newhouse, but that credit disappeared after two weeks, and Quirt presumably took care of both art and story from then on. I've read the narrative twice at the beginning of the strip and it just doesn't sit right. Being content should be on EVERYONE's Bucket List. Reaching and having a comfortable retirement age is 1st on mine. I was surprised by a couple of Jim's. Make a hole in one? Jim golfs??? I'd love to see Jim win the lottery. Perhaps I should add THAT to MY bucket list -- seeing Jim win!